Whether used for shelving, floors or furniture, time-worn wood brings a touch of rustic charm to every space. If you can’t find authentic reclaimed lumber for your project, you can use new materials and apply surface distressing techniques to simulate centuries of use and wear. We’ll show you how. 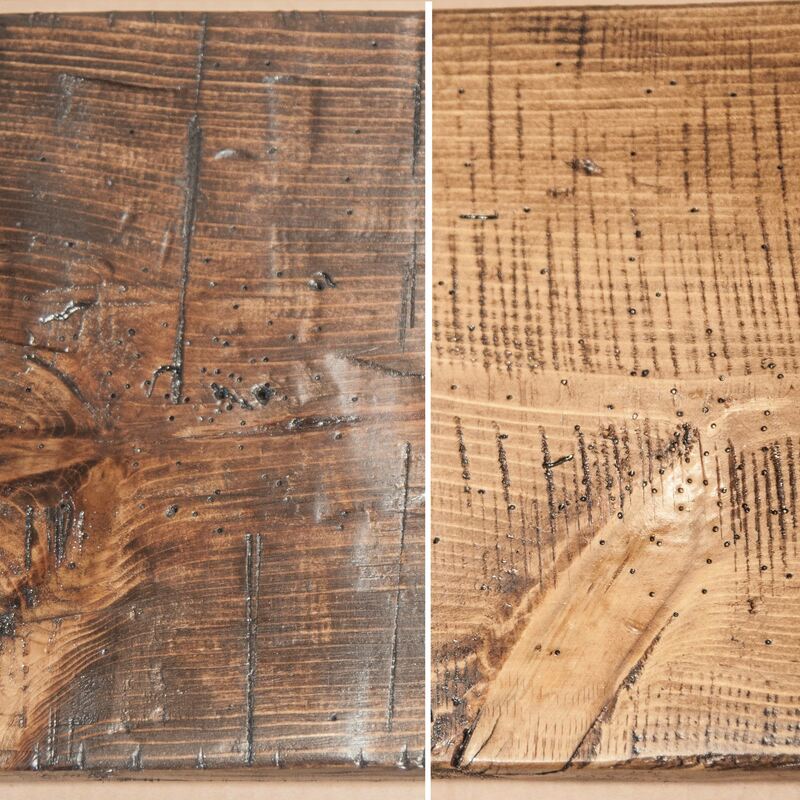 Before you start learning how to make wood look old, determine just how old you’d like it to appear. The methods used to make lumber from trees evolved over the centuries. The marks left behind can be roughly linked to various historical periods. So you need to first decide on the wood distressing techniques you want to use. Sawmills became widely used in the 1800s, leaving a telltale, repetitive pattern of blade marks on the wood. 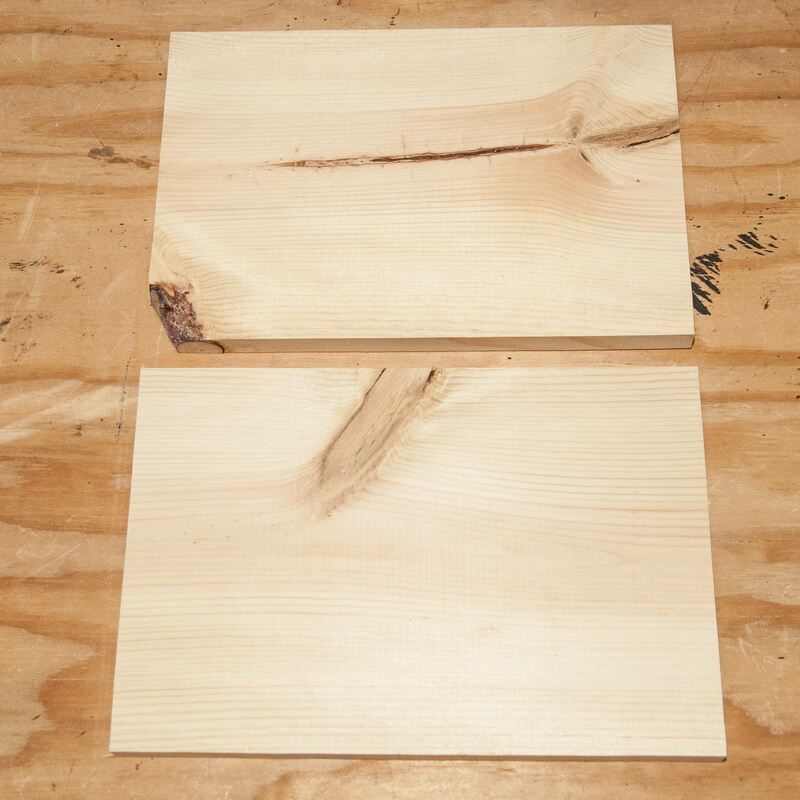 When choosing your lumber, look for boards with imperfections, such as knots, cracks and checks. These flaws help make new wood look old. 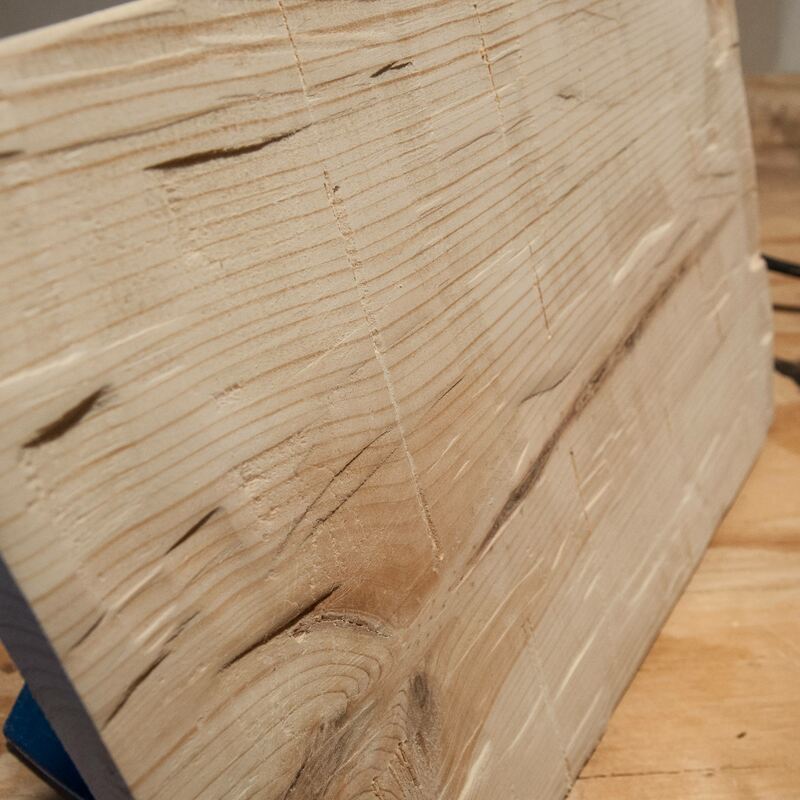 For this demonstration, we will be using 1-inch by 10-inch standard pine to show you how to make wood look old. Hand-hewing was the process of making a round log into square beams or boards using tools such as axes, adzes and hatchets. 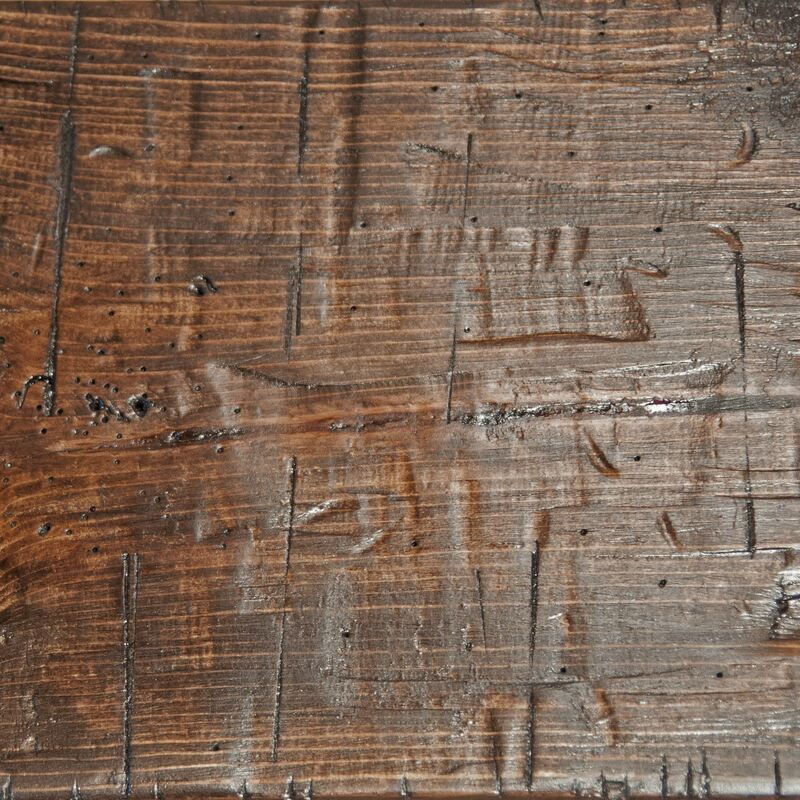 If you want your piece to suggest an earlier historical era, create the look of hand-hewn lumber. It’s a great starting point in making new wood look old. With an electric hand planer, make short, deep, random passes over the surface of the board, always going with the grain. Instead of the smooth, long motion you’d normally use with a planer, think of it as “scooping up” the wood with every pass. Make sure to go all the way to the edges of the board. 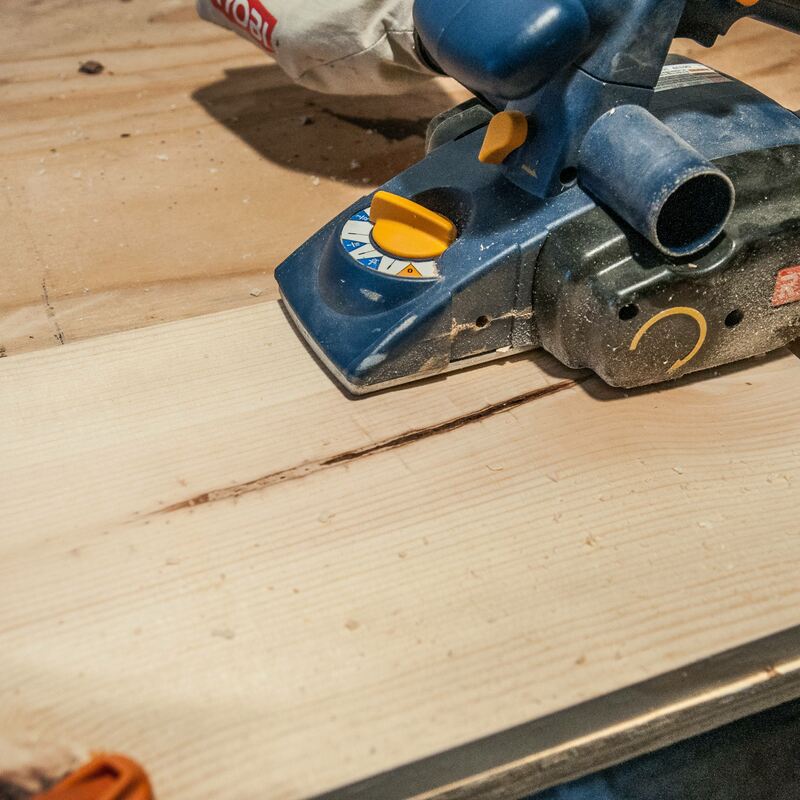 For your other projects, here’s how you should really use an electric planer. Actual hand-hewing involved gouging out chunks of wood with an adze. This left not only a scoop mark, but also a hard edge where the adze dug into the wood. You can simulate this mark using a masonry chisel. Position the chisel at one end of the gouges and give it a good whack with a hammer. 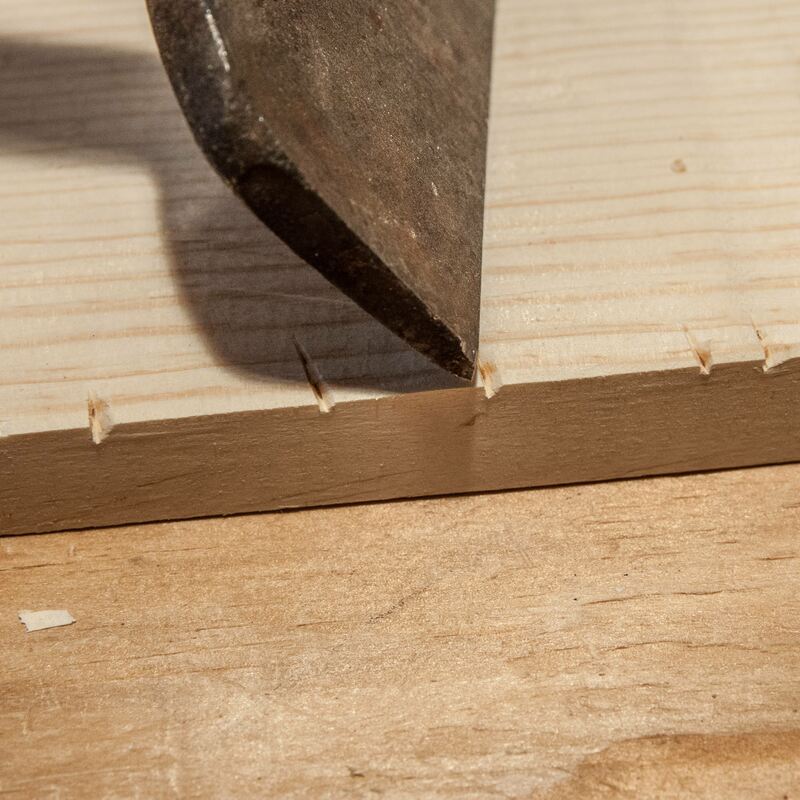 This step is easier with a sharp chisel. In case you don’t already know, here’s how to sharpen a chisel. Using a random orbital sander with a 120 grit disk, smooth out the planer marks so there are no hard edges, and knock down any splinters created by the chisel. 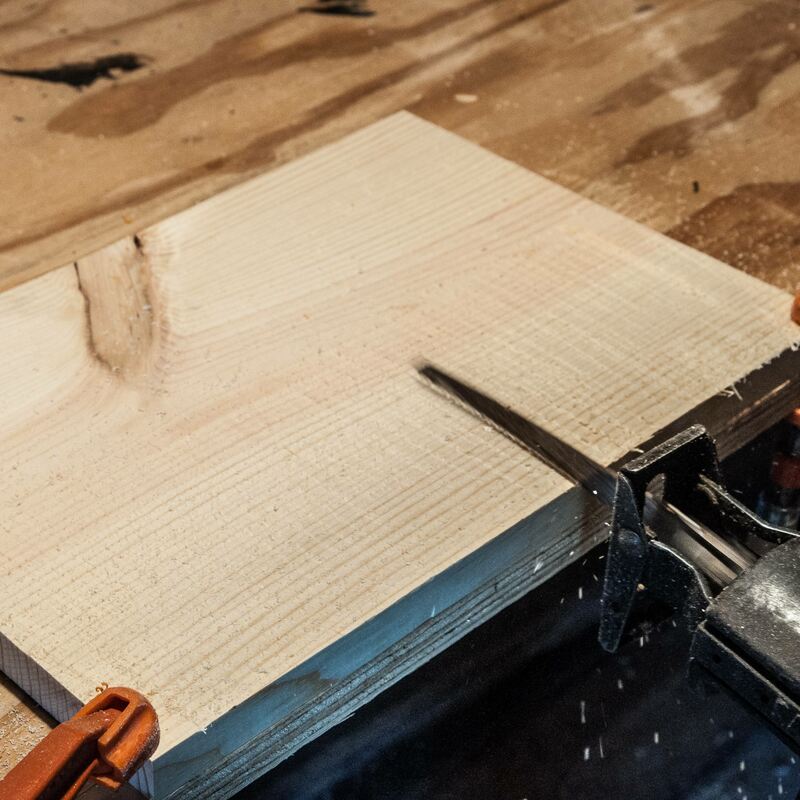 When you’re done, you should have a board with a gently undulating surface and hard gashes against the grain. You might be wondering if it’s really necessary to use a random orbital sander. Yes, it is! 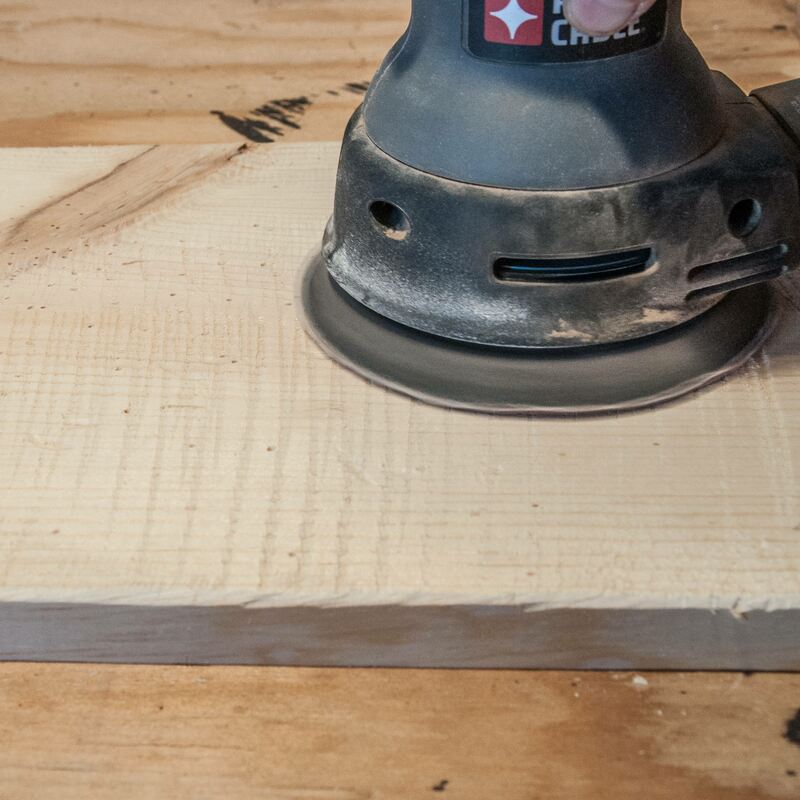 A standard orbital sander can leave circular marks on your project—a sure sign that it’s not old wood. Here’s the difference between a random orbital sander and an orbital sander. To suggest a slightly more recent historical period, you can recreate the appearance of saw marks. 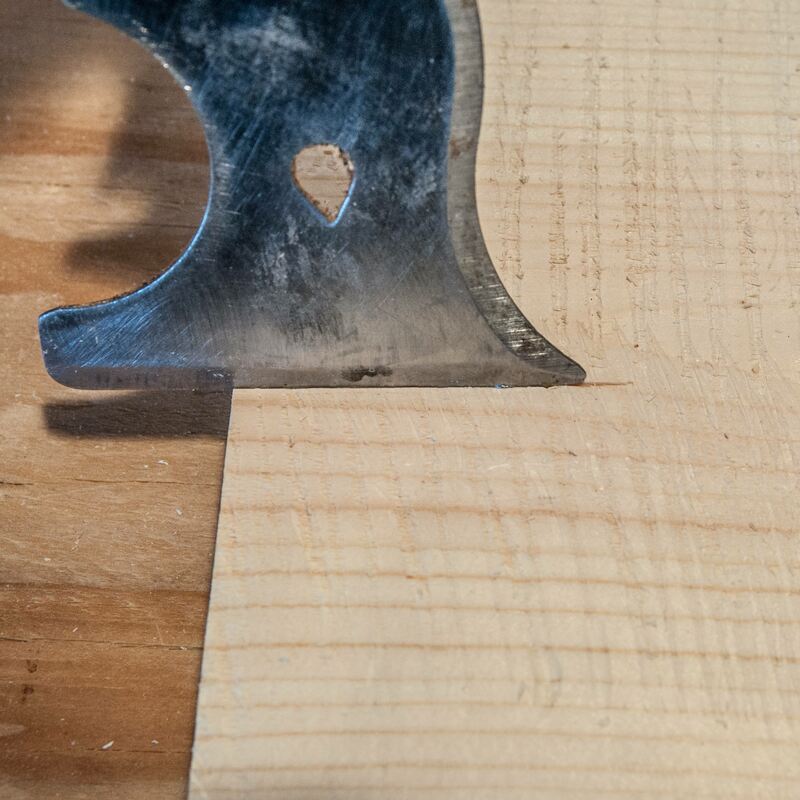 You can reproduce the classic circular saw pattern by slightly bending one tooth of a table saw blade, then scuffing the surface of your board, with the blade barely touching it. But there’s another a way to get sawmill marks that’s easier and doesn’t ruin a blade. Just swipe a reciprocal saw horizontally across the board. This will leave a straight pattern perpendicular to the grain that’s reminiscent of a sawmill process called skip-planing. If your blade isn’t long enough to cover the entire surface, turn the board around and work from the other side. Try to avoid overlapping the previous marks, though. 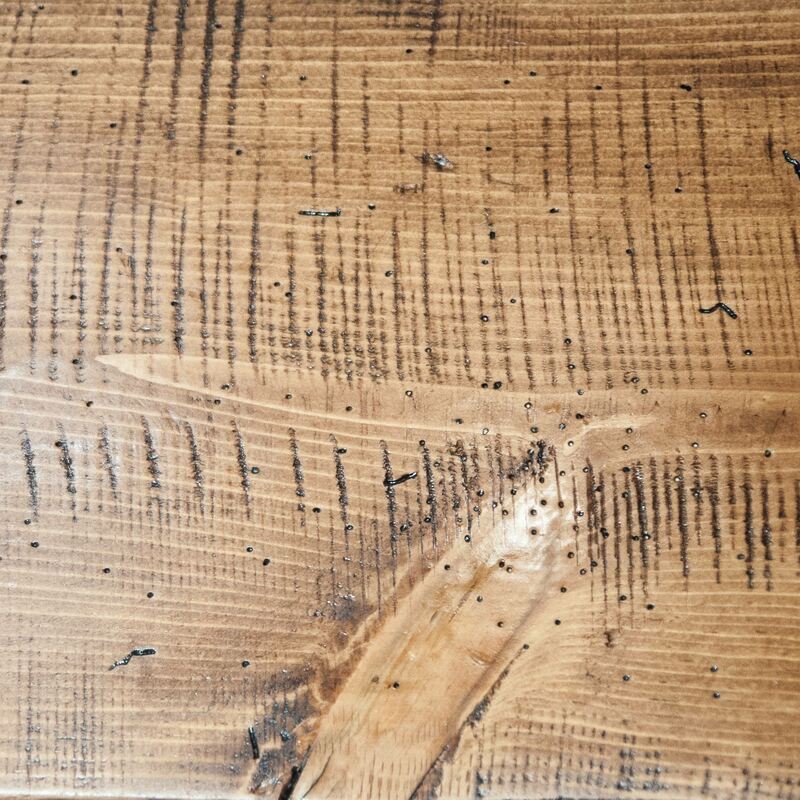 Historically, whether a board was hewn by hand or mechanically in a sawmill, subsequent signs of aging would have been made on top of those marks. You can use the rest of these techniques that make new wood look old on either a hand-hewn or skip-planed base texture. We’ll start with dents, all-purpose wear-and-tear marks. Hit the board repeatedly with a short length of chain. Be sure to wear eye protection and gloves, as the chain can bounce back at you. Or just place the chain on the board and hit it with a hammer. Be sure to move it around the board and keep the marks as random as possible. Don’t forget to dent up the board’s edges, too. Of course, your hammer can do a lot more than make dents. 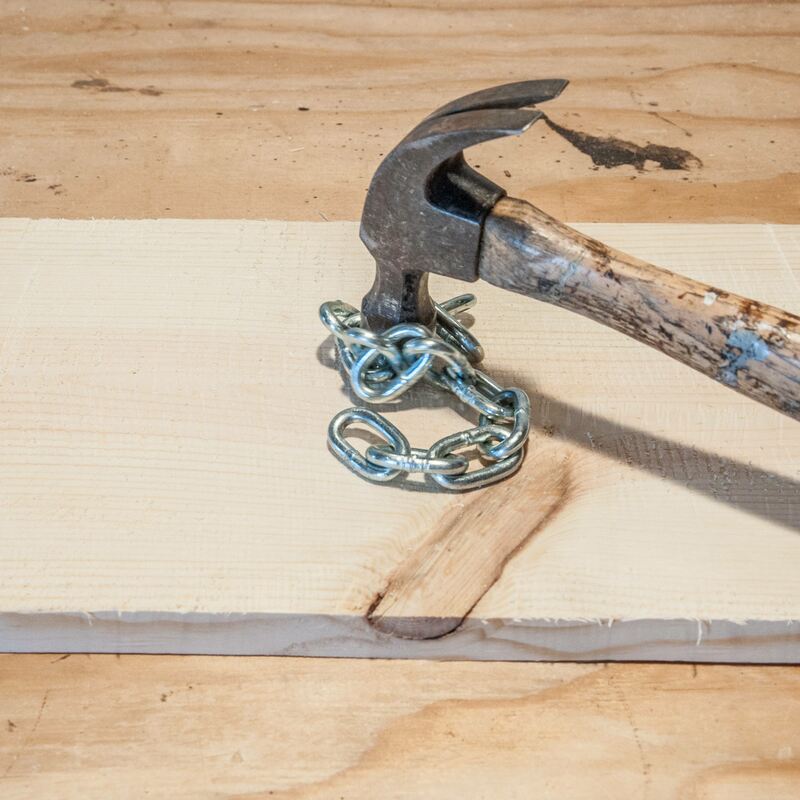 Check out these 10 awesome hammer hacks. Another great way to make new wood look old is to add cracks or splits. 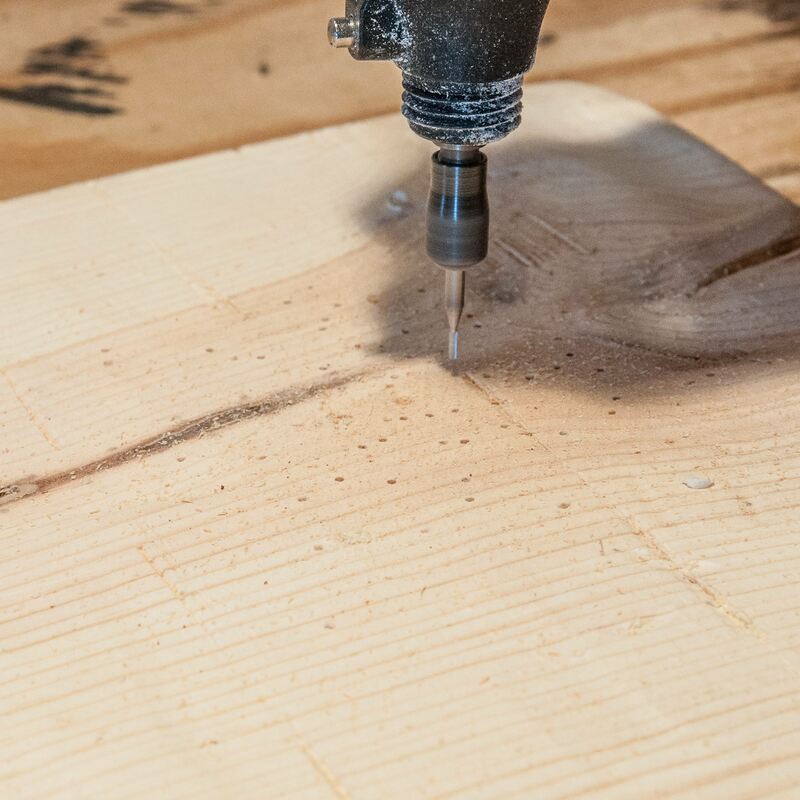 Place the edge of a painter’s tool on top of a grain mark at the end of the board, then tap it with a hammer. Rock the tool sideways slightly to create a space between the grain. What? You don’t have a painter’s tool? It’s one of the 15 must-have additions for a homeowner tool kit.. Tap the painter’s tool along the edge of the board and pry up a section of wood. This will create a v-shaped gouge on the end. If you weren’t trying to make new wood look old, you’d probably want to repair a gouge like this. 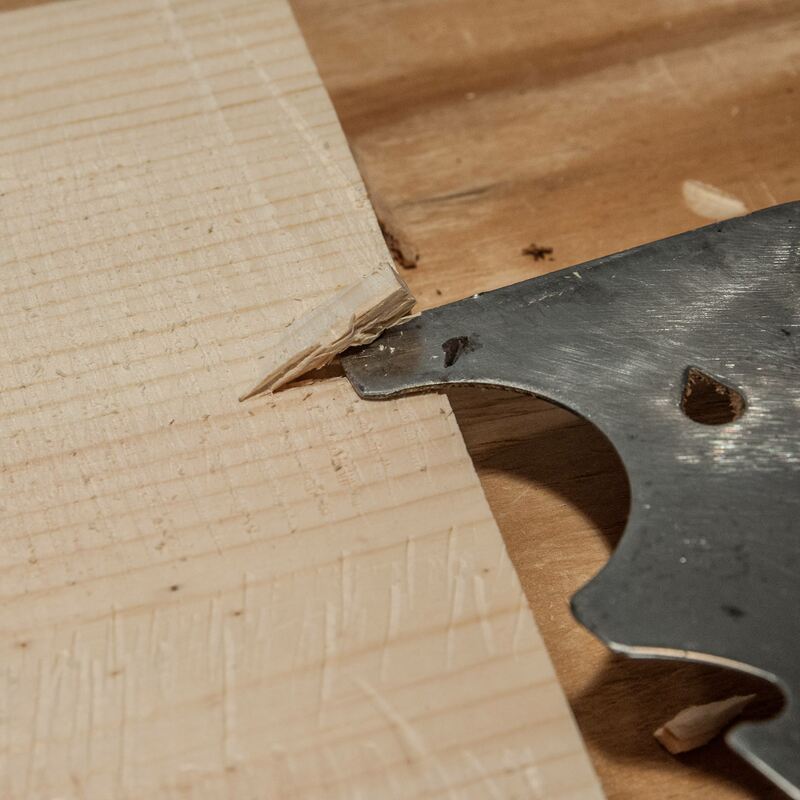 For future reference, here’s how to make a top-notch filler for repairing damaged wood. 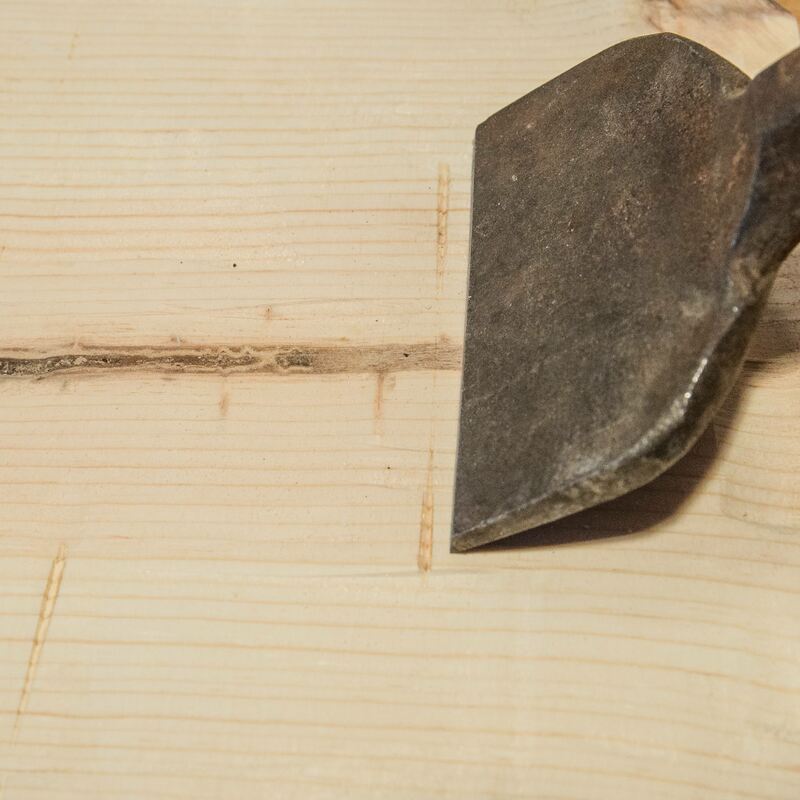 Use a masonry chisel to make marks along the edge of the board. If you’re going for the hand-hewn look, apply generously to suggest hatchet marks made when the board was shaped. On a skip-planed board, sprinkle them here and there as general wear-and-tear marks. 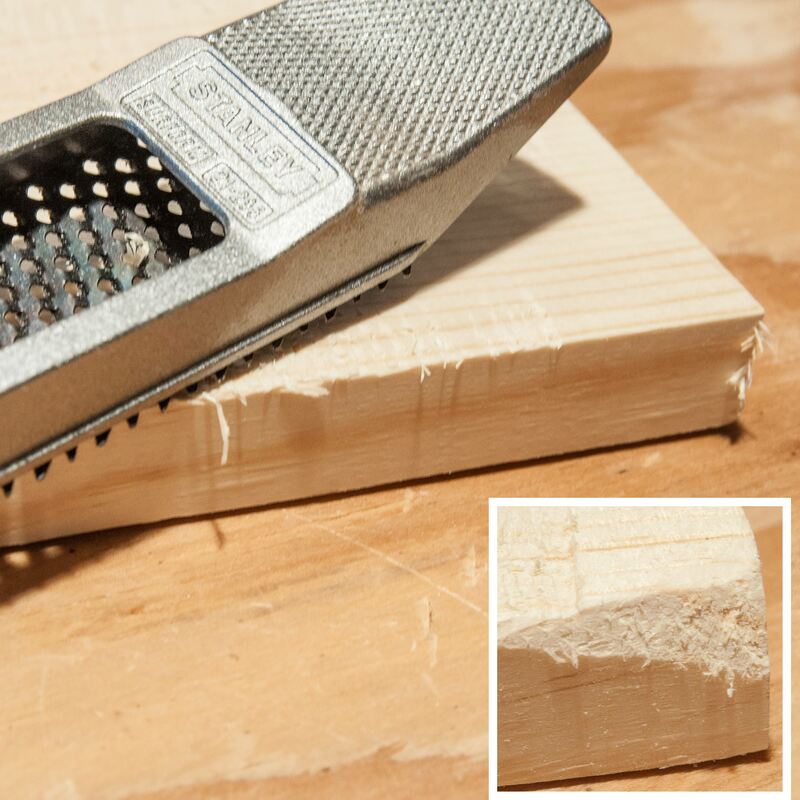 Take a wood rasp to the sharply cut edges of your modern board and smooth them down. Go lightly over hatchet marks so you don’t eliminate them entirely. Round the corners of your board to suggest random wear. Here’s a great tip on rasping. Worm holes really help make new wood look old. Use a small drill bit or Dremel rotary tool bit to drill the holes. (We used a 3mm Dremel cutting bit.) Choose an area on your board where you will concentrate most of the holes. Scatter holes lightly elsewhere. Drill most holes straight down. Randomly, drill some at an angle. Don’t have a Dremel tool? You should. It’s one of the 12 Tools Worth Splurging On. Using an engraving or cutting bit, draw short trails on the surface of the board, drilling a hole in one end. Most trails should be with the grain. Use worm trails sparingly for the most natural look. 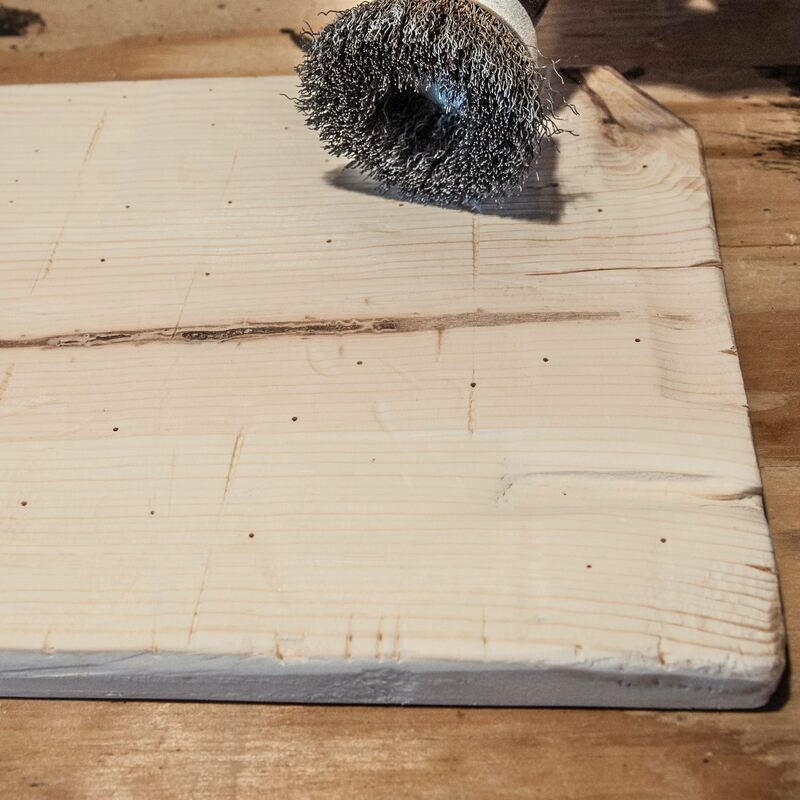 Sand the board thoroughly with 120 grit sandpaper, making sure to clean off any splinters. Learn how to get more life out of your sandpaper, along with 40 other tips, here. This technique is subtle, so it’s done after sanding. Place a wire brush at an angle on the board and run it with the grain. This will dig out the softer wood between the grain and give the surface more texture, which really helps make new wood look old. Wire brushing is more effective on soft woods such as pine. It works especially well on the end grain. Use a brush to get the dust out of small crevices and wormholes. Turn the piece over and knock on the back to dislodge any remaining dust. If your project involves an unfinished chair, dresser or table, you’ll want to be sure to see this great article on how to stain furniture. Note that the distressing will be more pronounced when you use a lighter stain. Choose a darker stain for a more subtle appearance. 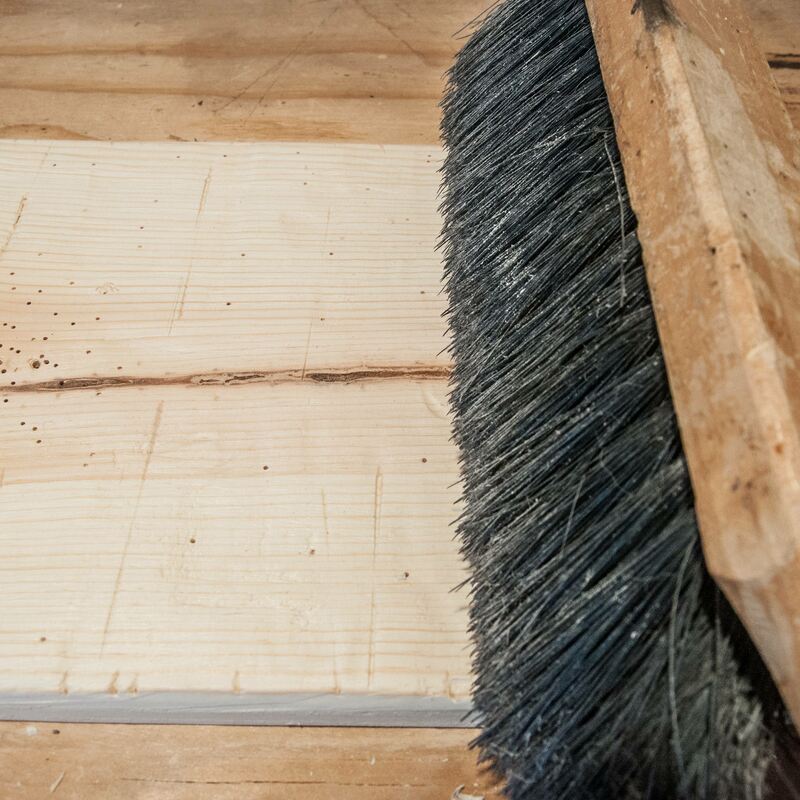 Stain your board using a disposable chip brush, as you may need to “stab” with the bristles to work the stain into the worm holes. Chip brushes are just one of the 20 Things DIYers Should Always Buy at Harbor Freight. We used two coats of Minwax Fast-Drying Polyurethane to seal the wood and protect it from moisture. 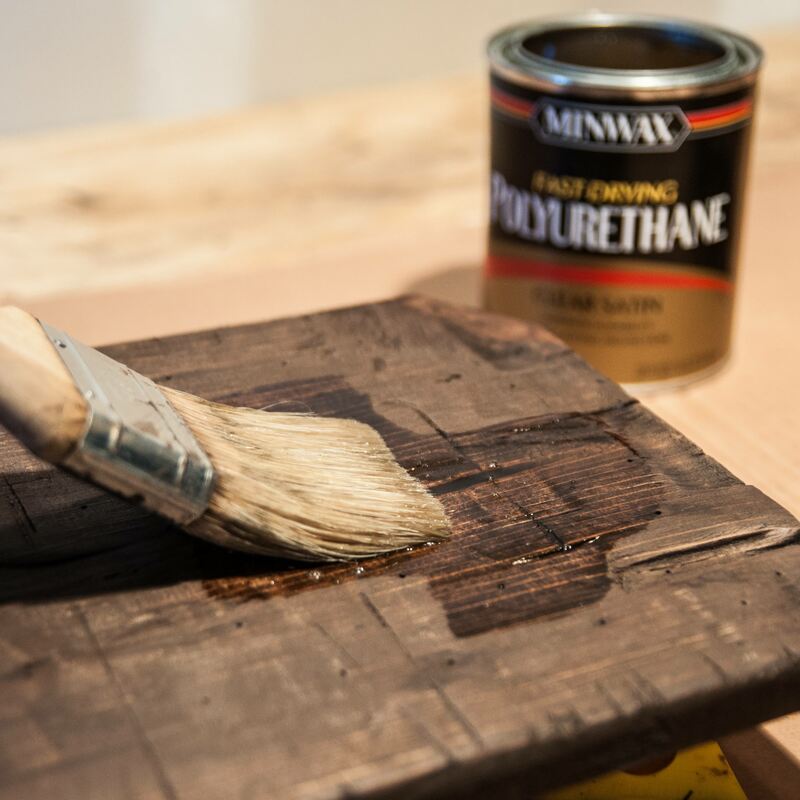 You may want to experiment with other types of “old world” top coats that help make new wood look old, such as a beeswax/turpentine finish or hand-rubbed tung oil. 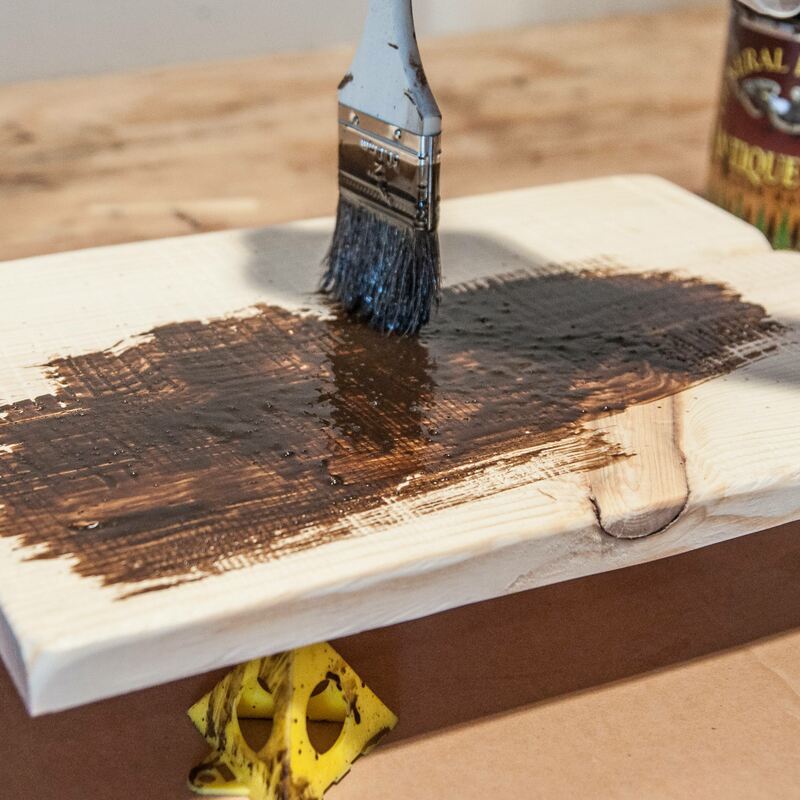 Here’s how to achieve a flawless wood finish with rub-on oil. You can help make new wood look old by pairing the style of hardware for your project with the base distressing technique that you chose. For hand-hewn pieces, use hand-forged or cut nails. 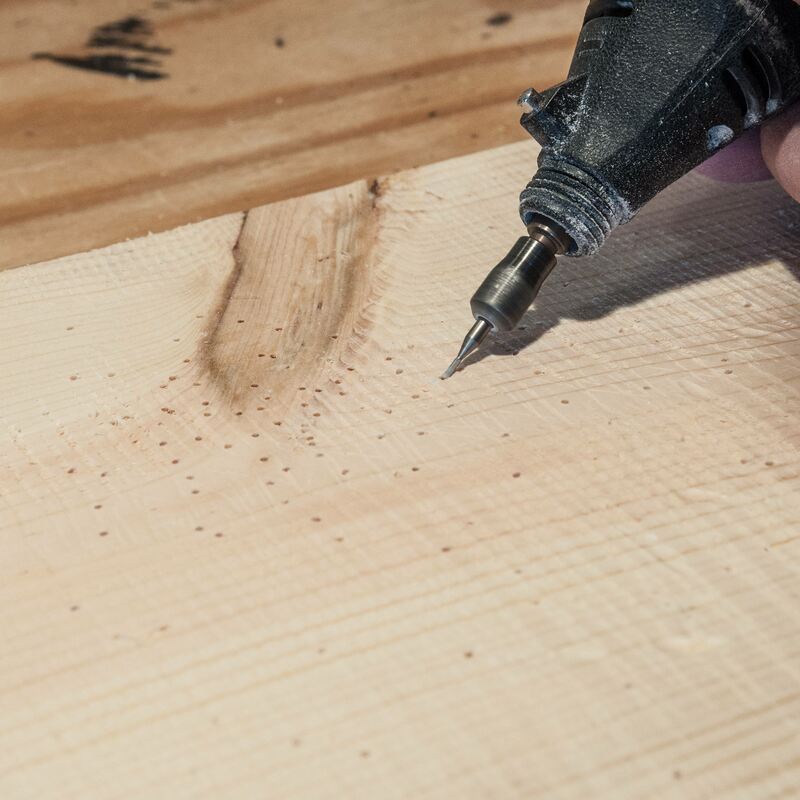 Drill a pilot hole, and make sure the long edge of the nail goes with the grain. 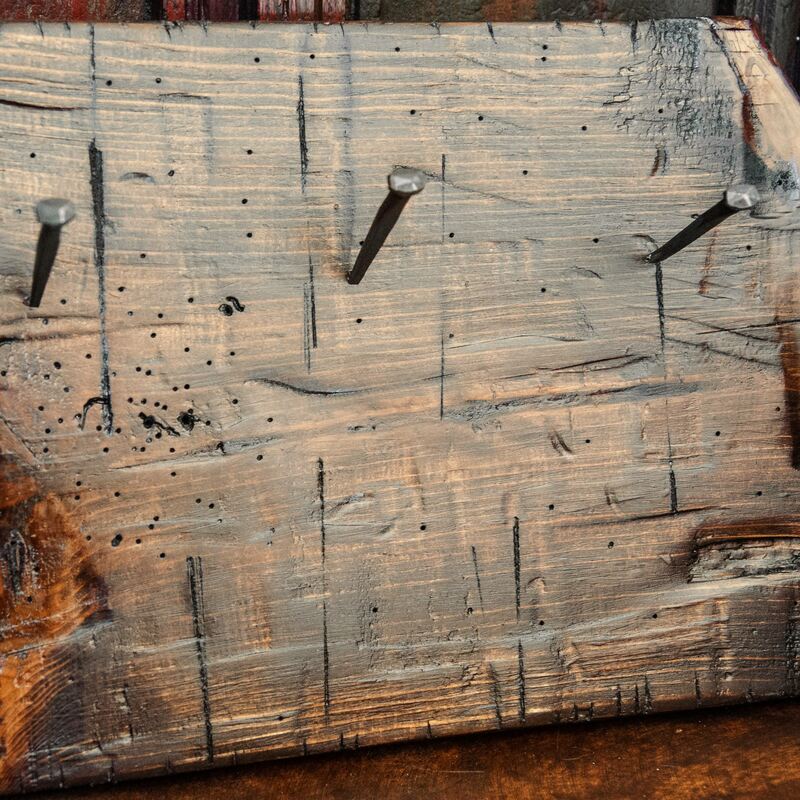 Hardware from the 1800s through the early 1900s looks great on boards with saw or planing marks. 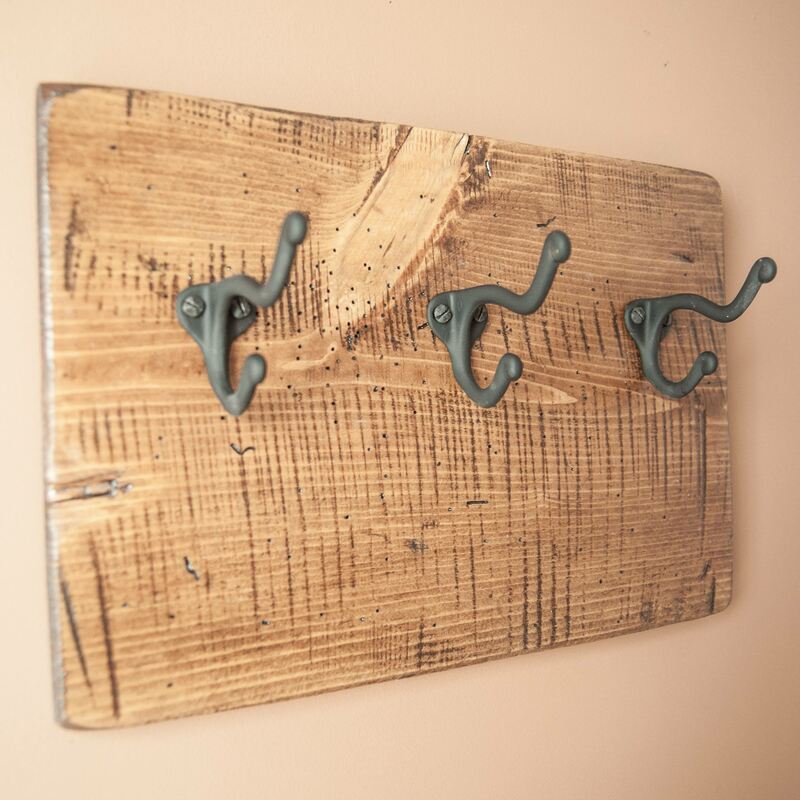 Here are more ideas for creative coat hooks. With her deep experience in brand creation, Devon brings a strong sense of brand purpose to the content she writes on behalf of clients. Quick to understand complicated subjects and reinterpret them for all audiences, Devon has written various types of pieces across many industries, including technology, manufacturing, health care, consumer packaged goods, financial services, entertainment and nonprofit. Her personal passions include photography, current events and volunteering for animal-related causes. Devon is based in Minneapolis, Minnesota.